Pay-Per-Click, or PPC, advertising can be a world of its own. To save you time and confusion, we’ve complied a list of the basics of Google Ads to help you better understand your marketing efforts. The best place to start is with the account structure of Google Ads. Google accounts contain 4 main elements – Campaigns, Ad Groups, Keywords and Ads. You have probably heard these terms used interchangeably in the past when discussing your Google Ads. Below is a visual representation of how these elements all fit together. Campaign: This is the main foundation of any account, housing all other elements that will impact how and when your ads will be seen. Campaigns are the main grouping that focus on an over encompassing goal or topic and control where your ad can appear (search vs display), the bid strategy, location targeting, and daily budget. The number of campaigns can vary depending on a company’s strategy. Ad Groups: The next building block of your account houses your keywords and related ads. 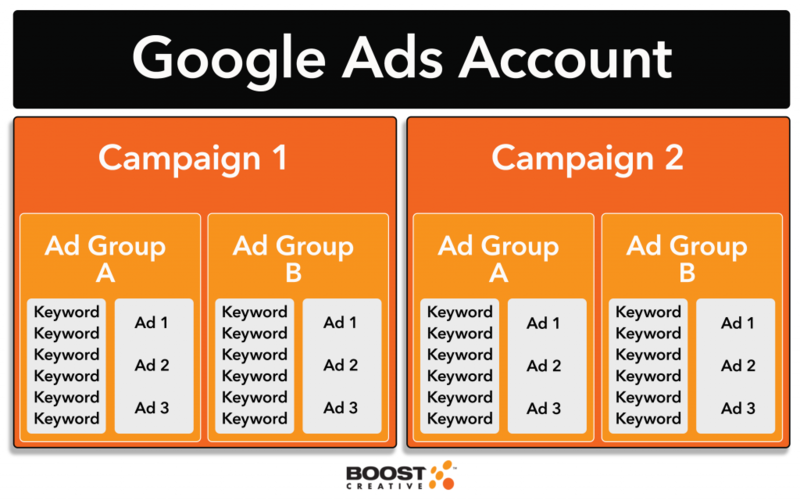 Each ad group within a campaign contain similar keywords that focus on one feature of the campaign’s topic. The number of ad groups within a campaign depends on a campaign’s overall strategy, but a minimum of one is needed in order to have a functioning account. Certain targeting features such as audience targeting, demographic targeting, negative keywords, ads and their extensions can all be controlled at the ad group level. Daily budget and location targeting, including location exclusions, can only be set at the campaign level. Keywords: The most well known part of the Google Ads structure, keywords are words or phrases describing a product or service that help determine where and when your ad can appear. The optimum amount of keywords are around 10-15 for every ad group. Keywords should be highly relevant to the exact product or service your company is advertising and should also appear within your ad’s copy and landing page. The more relevant your keywords are, the higher your click-through rate (CTR) will be. A high CTR leads to a lower-cost per-click. The max cost-per-click (CPC) bid is controlled at the keyword level. Ads: The final portion of a basic Google Ads campaign is the ad. Sometimes referred to as the creative, ads can appear as text in search engine results or as a banner images across millions of websites. The type of ad you have depends on the type of campaign you choose – search display, or a combination of both. Ads are shown to potential customers based on a campaign’s strategy, such as retargeting or location, and the keywords used for a search query. Ads are controlled at the ad group level with a recommended minimum of 3 ads per group. Ads should relate specifically to the keywords within their ad group and their associated landing page to increase their CTR, leading to lower CPC and higher auction rankings. A local bakery is wanting to start promoting their company using Google Ads. They are wanting to promote various breads, cookies, and cakes with search advertisements that focus on each product individually. The campaigns for the bakery will focus on its three main product lines: Breads, Cookies and Cakes. There will be a campaign created for each of these topics. Next, ad groups will be created for each campaign to group relevant keywords with specific ads. For the Cake campaign, the ads groups would be broken down into each cake related service that the bakery provides. Keywords that are related to each Ad Group topic are researched and curated. Keywords for the Cupcake ad group would focus on common cupcake related search terms and common descriptions of the bakery’s cupcake services. Lastly, the ad creative is written. The copy in the bakery’s search ad will be peppered with relevant search terms that were included in the ad group’s keywords and landing page. Ad extensions are created to highlight special topics within the bakery’s cupcake service that would entice a user to contact them. Make sense? There are many more factors that impact the success of a Google Ads campaign, but these are the 4 key elements. Each part of a campaign requires constant tweaking and revision to match the constantly evolving digital world. New updates, new search volumes, and changing markets make campaigns into living, breathing organisms that require constant care. If one element is left unattended, it could cause the entire campaign to ultimately fail. That’s why it is important to know the ins and outs of the platform and always be constantly monitoring your ad campaigns. Sound like a lot to handle? Don’t worry, the PPC experts at Boost Creative are here to help. The team at Boost Creative are up to date on all the best practices of PPC and Google Ads, and have experience optimizing campaigns to provide the best ROI possible.